The Arnolfini portrait: the artist’s alterations. 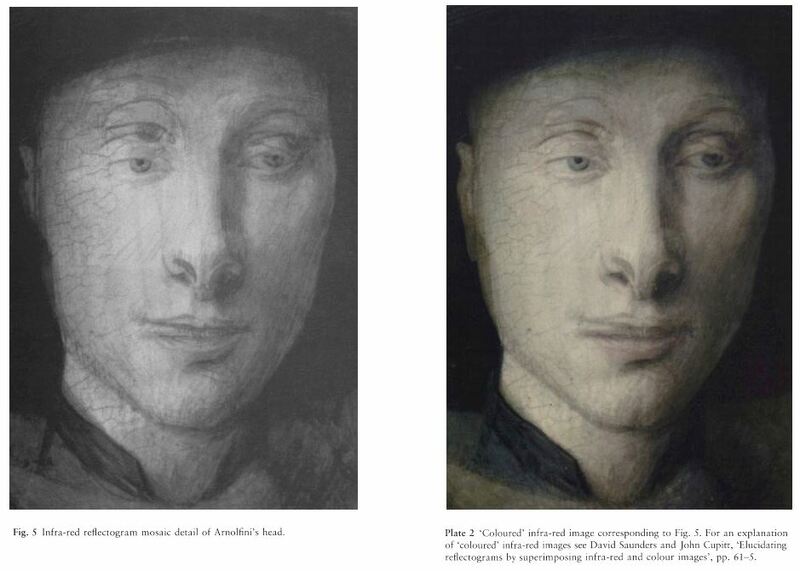 In 1954 Martin Davies published and discussed infra-red photographs of Jan van Eyck’s ‘Portrait of Giovanni (?) Arnolfini and his Wife Giovanna Cenami (? )’ (NG 186) (note 1); these have attracted a considerable amount of comment from subsequent writers (note 2), for they reveal a great deal of underdrawing and a surprising number of alterations. A composition of seemingly immutable perfection has been created to a large extent by trial and error on the panel itself. There can be no real doubt that Jan van Eyck executed the underdrawing and was himself responsible for all the alterations, just as it appears certain that he painted, without the help of assistants, every significant part of the picture. Infra-red reflectograms made in 1994 (Figs. 1–14) reveal a great deal more of the underdrawing and many more changes (note 3). They provide a basis for re-examining the genesis of this composition. The drawing is executed in a liquid medium using a brush (note 4). In some places the fluid nature of the drawing material is particularly clear since pools of paint, which collect at the end of brushstrokes when a loaded brush is lifted from the surface, can be seen (Fig. 2). The figures, the main architectural elements of the room and major pieces of furniture such as the bed are all outlined. Van Eyck has used a complex system of hatched brushstrokes to indicate areas of shadow. In flat areas such as the back wall and the floor between the figures, the strokes are roughly parallel and tend to slant down from right to left (Figs. 3 and 4). In other areas such as the bolster and the bedspread (Fig. 9) the direction of the brushstrokes varies, giving a suggestion of volume, while the intensity of the overlapping lines indicates the depth of the shadow. A similar system is used in the underdrawing for the heads (Figs. 5 and 6) but on a much finer scale. 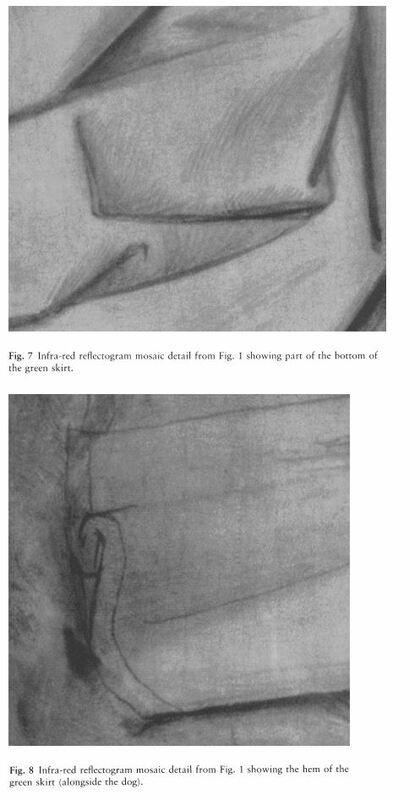 The drawing in the green drapery is simpler and employs a more formulaic system of fold lines and short hatching strokes (Fig. 7). This drawing seems, in a way, more careful and precise than that of the background drapery. The hatching is delicate and once again subtleties of volume and shadow are indicated by the direction and intensity of the strokes. In contrast the fold lines and the outline of the hem (Fig. 8) are bolder, seemingly coarser lines than those seen elsewhere in the underdrawing. It is not particularly unusual to find that small details such as the oranges, the beads and the two pairs of shoes are not drawn, but more surprisingly, no underdrawing could be found either for the dog or for the chandelier (Figs. 3 and 4). In both these areas brushstrokes typical of the general underdrawn hatching of shadows can be seen crossing the forms, which suggests that the surface paint is being successfully penetrated. Numerous changes occur in both figures. Arnolfini’s hat was drawn a little higher and the shape was changed slightly during painting when the brim was enlarged over the wall and the crown was extended sideways. Rather more important: Arnolfini was first drawn with his eyes higher than they were finally painted, and looking more to his left. The drawing for his nose and mouth is also above the painted features (Fig. 5 and Plate 2). His wife also shows changes in the face (Fig. 6 and Plate 3). Her eyes were drawn lower and slightly to her left, and her gaze has shifted towards her husband. Her nose and mouth are less changed. It is interesting to note that the shift of her eyes must have been a fairly late change. The very fine, delicate hatching which indicates the shadows in her face has been completed with respect to the drawn eyes. The eyelids and sockets for the painted eyes are not drawn. The change to her husband’s head seems to have been made at an earlier stage since the new positions for all the features are drawn and the hatching of the shadowed areas gives form to the second head. 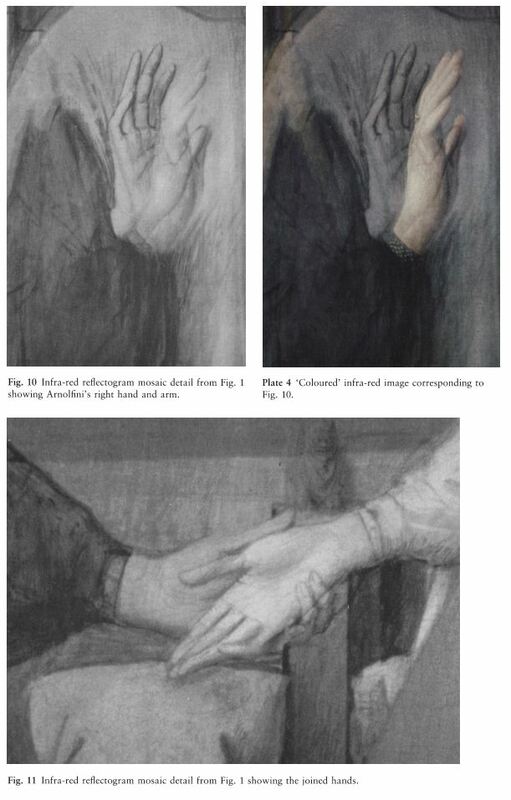 The shift in position of Arnolfini’s right hand was clearly visible in the old infra-red photographs but the reflectogram now reveals the re-drawing of the whole arm that resulted from this change (Fig. 10 and Plate 4). Both his shoulders have been moved down. On his left there are two drawn contours above the final position (which is also drawn). 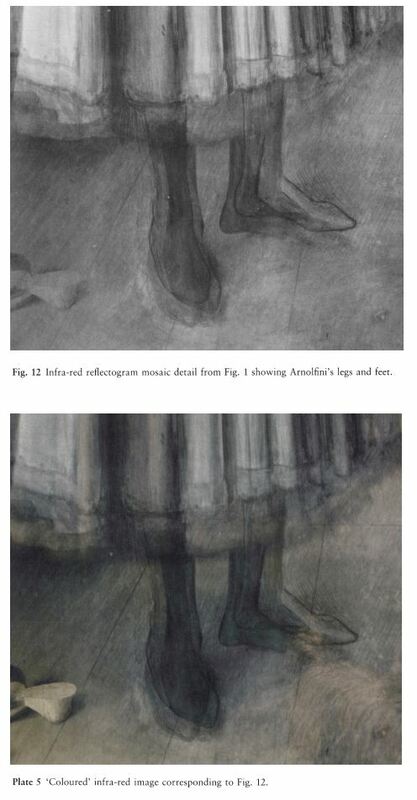 The reflectogram in the area of Arnolfini’s feet shows further changes (Fig. 12 and Plate 5). There are three distinct versions of each foot: a drawn outline, a painted foot that was painted out, and the final painted foot. The drawn feet are further apart than the final position of the feet. The length of the skirt was drawn shorter and underdrawn hatching which relates to the floor can be seen beneath the paint of the fur edging. Fewer changes have occurred in the figure of Arnolfini’s wife. The top of her head was drawn slightly lower and the white paint of the veil extends slightly over the red of the bed curtain as a result. Her left hand was originally drawn with the fingers rather awkwardly angled downwards (Fig. 13). 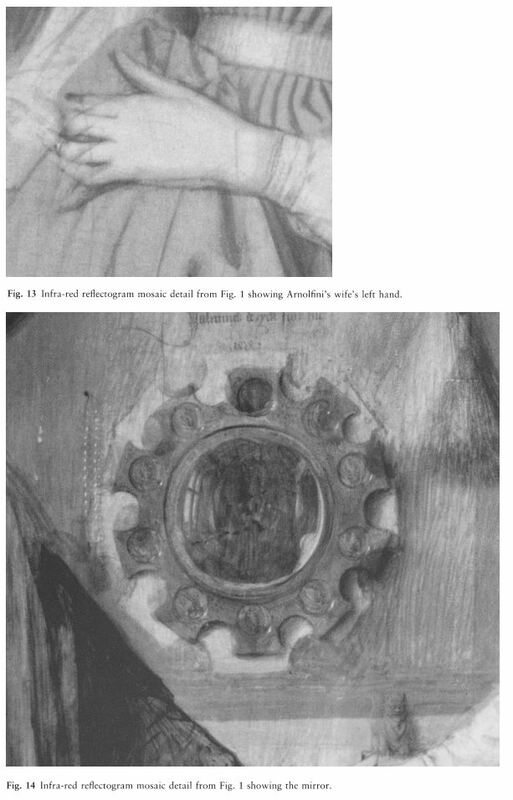 The thumb of her right hand was drawn sticking out parallel to Arnolfini’s (Fig. 11), while his fingers curl further around his wife’s hand in the drawing. In the background the most significant change is the mirror. The drawing shows a larger mirror with only eight segments in the frame, each of which clearly has a roundel (Fig. 14). The bench and chair from which the brush hangs were altered at quite a late stage; red paint from a higher back to the bench lies under the grey wall beneath the mirror, while the tall wooden chair is painted over the wall and is not drawn. A brush, larger than the painted one, was drawn higher and nearer the mirror, apparently hanging from the wall. The carpet was drawn shorter and has been extended forwards across underdrawing for the floor to meet the hem of the green dress. The chest on which the oranges lie has a more ornate scalloped opening at its base in the underdrawing. Finally, there are changes in the architecture. The cross-bar in the window seems to have been drawn lower. The shutters on both sides were originally drawn to match the lower position of the cross-bar. The dark shadow in the reflectogram near the top of the window is more of a problem to interpret. The underdrawn lines run parallel to the painted ceiling joists and can be read as a continuation of the ceiling. This seems improbable since it would have made the ceiling lower and Arnolfini unusually tall. It is more likely that the lower window required an area of blank wall above it meeting the ceiling joists in the region of the dark line which crosses the painted shutter, and that the horizontal bottom edge of the dark area marks the top of the drawn shutter. It is perhaps helpful to describe the under-drawing as it was before Jan van Eyck began to paint. An object in an octagonal frame, presumably a mirror, and a large brush hung on the wall above a higher and longer bench. The beads, the chandelier, and the chair, with all its carved ornament, were not present. Arnolfini, who had a very much larger face and looked towards his wife, presented the palm of his right hand and grasped his wife’s hand more firmly with his left. His garment was shorter and he stood with his feet further apart. His wife had a smaller face and looked downwards. The dog and the two pairs of shoes were not present. The painted signature and date cannot have been conceived until the ten-sided mirror-frame and the chandelier had been executed. There are no traces of ruled guide-lines for the signature, which, moreover, is not horizontal but rises from left to right. Arnolfini’s wife has, like her husband, a small thorax and arms, though her hands are long and elegant. Her thumbs are impossibly long. It would appear that van Eyck has slightly distorted her features to make them conform more closely to contemporary ideals of beauty and that he has manipulated the proportions of both figures in order to stress the heads and hands. What is very striking is that the first drawing of the heads of Arnolfini and his wife are even more distorted than the painted heads. His eyes and his mouth are higher and larger, his face is much bigger; her eyes are lower and her forehead is impossibly high. It is puzzling that Jan’s drawn portraits should be more distorted than his painted portraits. His one surviving portrait drawing on paper is the silverpoint of Cardinal Albergati (Dresden, Kupferstich-kabinett), which, with its elaborate colour notes, was certainly made from life. There the head is much more distorted than the painted portrait that was based upon it (Vienna, Kunsthistoriches Museum) (note 6). In the drawing, by instinct or by design, Jan has diminished the cranium and enlarged the features, whereas in the painting the distortions are rather less pronounced. 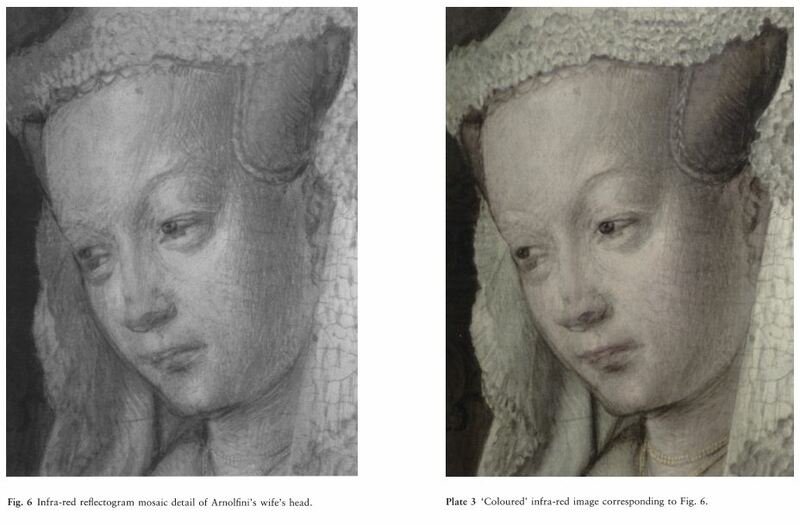 The Arnolfini heads have undergone parallel transformations, from very distorted initial underdrawing to less radically distorted painting. Arnolfini’s head is turned slightly towards his wife but his nose and ear are seen almost frontally, as was the larger, underdrawn nose, possibly in an effort to make the nose, and particularly the nostrils, look less grotesque. The painted features are still rather too large for the face, and the face is still too large for the head and body. His wife, in contrast, has better proportioned features but her eyebrows, drawn and painted, are impossibly high, and her nose, drawn and painted, is turned further into profile than the rest of her head. Such minute adjustments in the heads allowed van Eyck to represent each of his subjects’ features in its most characteristic and recognisable form; by such means, without doubt, likeness is enhanced. In the underdrawing, Arnolfini’s right hand must have looked rather forbidding. Once it had been decided to show in the mirror reflections of the two visitors, it may have seemed imperative to turn the hand so that his gesture was more welcoming. At the same time, perhaps, his glance was turned away from his wife and towards the visitors. The lengthening of his garment and the changes in the positions of his legs would have made him look very much less ungainly (note 7). It has often been argued that many of the details in the portrait have symbolic significance (note 8). Most of these details – the dog, the discarded shoes, the chandelier, the single lighted candle, the oranges, the beads, the image of Saint Margaret – turn out not to have been underdrawn but to have been put in at rather a late stage. It can no longer be maintained that van Eyck was working to a symbolic programme carefully elaborated in advance. The theory that the painting tells a story, that it is more than a portrait, needs to be reconsidered. The many alterations must also indicate something about the relationship between van Eyck and Arnolfini, who would have been in contact both in Bruges and at the Burgundian court. 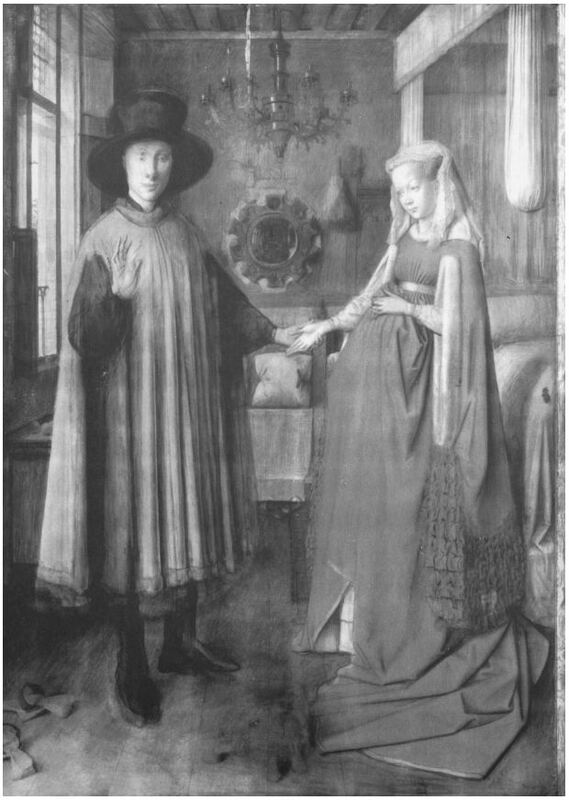 The two men may have been friends; the fact that van Eyck painted another portrait of Arnolfini (Berlin, Staatliche Museen; Fig. 15) suggests that they were (note 9). The double portrait may not have been commissioned in the usual way; it could even have been a gift from Jan to Arnolfini. If the Arnolfini commissioned and paid for their portrait, they must have been in constant contact with van Eyck, to propose, or to be consulted over, every detail. 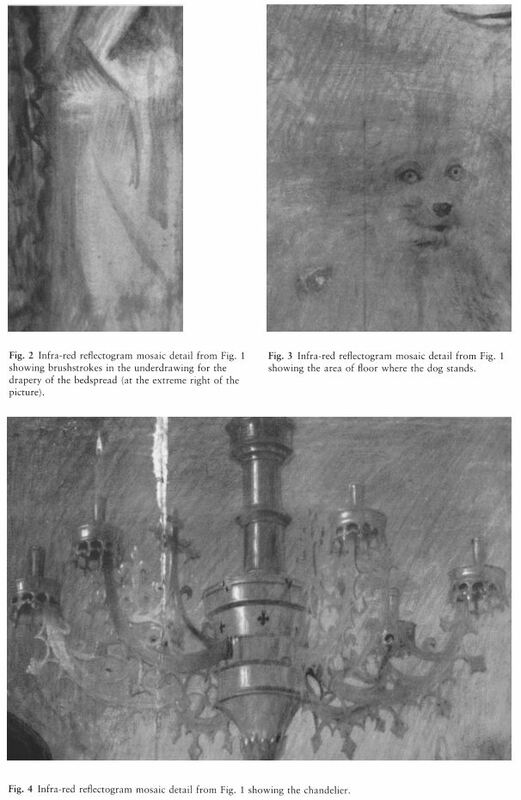 While much remains to be discovered about the double portrait and about Jan van Eyck’s working procedures, the new evidence of the infra-red reflectograms must be taken into account in any future investigations of the painting. The authors wish to thank David Saunders for his work in combining the infra-red and colour images published in this article. The technique is described in detail on pp. 61–5. Rachel Billinge is Leverhulme Research Fellow in Infrared Reflectography at the National Gallery. Lorne Campbell, Reader at the Courtauld Institute of Art, holds a British Academy Research Readership in order to work on the new Catalogue of the Early Netherlandish School pictures. The painting was examined during the systematic technical survey of all the pictures undertaken in connection with the preparation of the catalogue.